baráber [b?rb?r] noun (plural barábers) somebody who cuts hair: somebody whose profession it is to cut men’s hair and shave their beards verb (past and past participle barábered, present participle baráberáing, 3rd person present singular barábers) 1. transitive verb cut somebody’s hair: to cut or shave somebody’s hair, especially a man’s 2. intransitive verb be barber: to work as a barber [13th century. 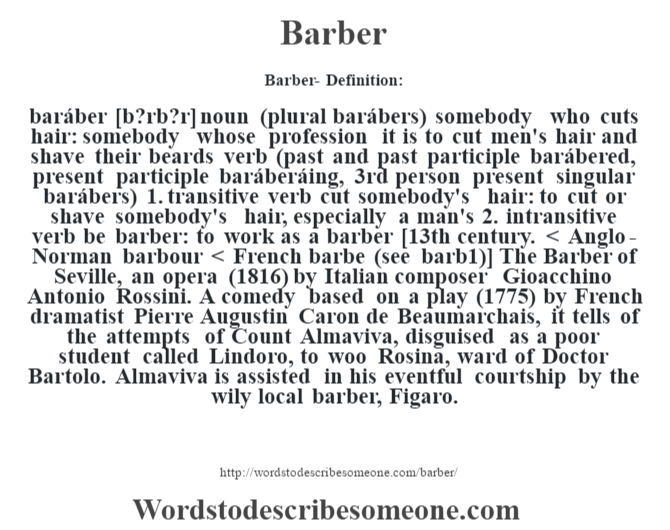 < Anglo-Norman barbour < French barbe (see barb1)] The Barber of Seville, an opera (1816) by Italian composer Gioacchino Antonio Rossini. A comedy based on a play (1775) by French dramatist Pierre Augustin Caron de Beaumarchais, it tells of the attempts of Count Almaviva, disguised as a poor student called Lindoro, to woo Rosina, ward of Doctor Bartolo. Almaviva is assisted in his eventful courtship by the wily local barber, Figaro.